Prof. Yacine Rezgui is Professor of Chemical Engineering and a member of the Laboratory of Applied Chemistry and Materials Technology at the University of Oum El Bouaghi since 2001. His research interests include catalysis in the petroleum field as well as hydrocarbons combustion. Inspire Magazine spoke with Dr. Rezgui to find out more about his work which won him and his coauthors the prize of the 2013 Algerian Paper of the Year Award in the category of Chemical Sciences. The winning paper is entitled “Reduction of PAH and Soot Precursors in Benzene Flames by Addition of Ethanol” and can be accessed here. Inspire Magazine: Thank you for speaking to Inspire Magazine, and many congratulations for winning the 2013 Algerian Paper of the Year Award in Chemical Sciences. How do you feel about winning this award? Yacine Rezgui: I am very glad to have this opportunity. I received an e-mail from anasr.org inviting me to participate in this competition and my decision to participate was quite quick. So I selected the most recently published paper and sent it. When my paper was nominated for best paper in the chemistry field, I was very glad and I felt that my work and effort were rewarded. Yacine Rezgui: Our current work focuses on the development of clean fuels, especially those derived from biomass, with an aim to improve air quality by reducing harmful emissions issued from gasoline engines. There is increasing interest in the study of renewable and alternative cleaner fuels which is driven by the limited availability of fossil fuels as well as environmental and public health reasons. In this context, the use of oxygenated additives such as ethers and alcohols could contribute to potential solutions. Ethanol is one of the most widely studied and used oxygenated additives because it can be produced from agricultural products and scrapped resources. Nowadays, considerable efforts have been invested in understanding the reaction network that leads to the reduction of harmful pollutants by the addition of ethanol. In this research paper we report some important findings from a long-term project which explores more efficient and less polluting transport. The work explores the potential of alcohol in reducing harmful emissions from automobile engines and to optimize the quantities of these alcohols in conventional fuels. Yacine Rezgui: Combustion processes such as transportation, power generation, and waste incineration generate environmentally hazardous airborne contaminants such as polycyclic aromatic hydrocarbons (PAHs) and soot. The International Agency for Research on Cancer (IARC) classified PAHs as a “known human carcinogen”. Soot is a black carbonaceous substance that results from the incomplete combustion of hydrocarbons. Soot is thought to be the second-leading cause of global warming after carbon dioxide, with an estimated emission rate of 1.6 million tons per year in combustion processes. When these compounds escape from the combustion processes into the atmosphere they can also cause both acute and long-term respiratory effects, and when they deposit on soil and plants and water surface they contaminate the human food chain. It is therefore very important to reduce these compounds. In recent years, the refinement industry has devoted a tremendous effort to reducing PAH and soot emissions by enhancing the quality of Diesel. The automotive industry has also contributed to decreasing PAH by using various technologies designed for the Diesel after-treatment processes in exhaust cars. On the local level however, I think that neither the energy, nor transport or healthcare sectors have paid much attention to the damage caused by these compounds. Yacine Rezgui: This paper is the first step in our research containing two parts: the modification of the composition of petroleum fuels and the gradual replacement of these fuels with alternative ones. There are two mechanisms for modifying petroleum fuels, the first and most common approach involves the addition of oxygenated products such as ethers and alcohols, and the second less popular involves ameliorating the fuels properties by catalytic processes which convert linear hydrocarbons to ones which have good properties. The work described in this paper complements the extensive experimental work reported in the literature. IM: What kind of support, if any, have you received to help accomplish this work? 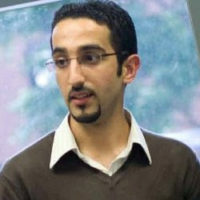 Yacine Rezgui: This paper was accomplished with the support of the CDER (Centre de Développement des Energies Renouvelables). The research project was part of a national research project (PNR) accepted by the Ministry of Higher Education and Scientific Research of Algeria. We have also established collaborations with several research groups especially from french universities. Yacine Rezgui: As you know, Algeria is one of the major oil-producing countries and known to have huge oil reserves, I started research in this area in order to contribute to the development of this field in my country. This work is complementary to the research of other teams in our laboratory. IM: What is your assessment on the state of this type of research in Algeria? And how do you see it progressing in the future? Yacine Rezgui: I think that this type of research is too difficult to realize in Algeria because it depends on combustion materiel which is very difficult to handle. The study of combustion requires sophisticated in situ analysis material as well as the use of gases such as hydrogen which must be handled with care. Close collaboration with laboratories with proven track record in the field could overcome these difficulties. 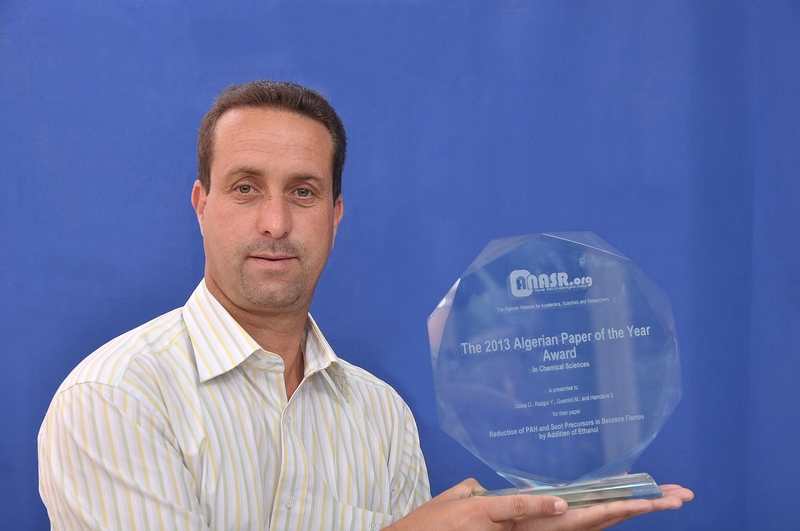 Congratulations on winning anasr.org’s 2013 Algerian Paper of the Year Award in Chemical Sciences. Prof. Dr. Yacine Rezgui is an internationally recognized expert in the field of Catalysis and Combustion. I wish you unlimited success in the future.